There isn’t a better time to be alive in Montana than in September and October with cool weather, revived fisheries and the start of serious streamer fishing. October 14-19, we offer a school at Healing Waters Lodge that centers on fall fishing. This means fishing October Caddis and Blue Winged Olives along with plenty of streamer fishing. 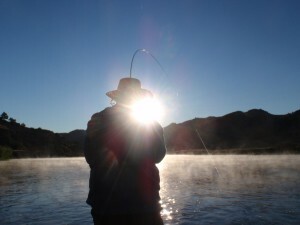 Streamer fishing translates into large trout which becomes the stuff dreams are made. The school will emphasize on streamer techniques with a variety of flies. Price includes six nights lodging and all meals at the lodge and five days of instruction and fishing for $2,995. Call Mike Geary at 406-459-2030 for more details. Football games will be recorded for you upon request!